43 year old presents with 20/30 OD, 20/20 OS ; IOP at 25 mm Hg OD on and 18 mm Hg OS on timolol/dorazolamide combo OU. 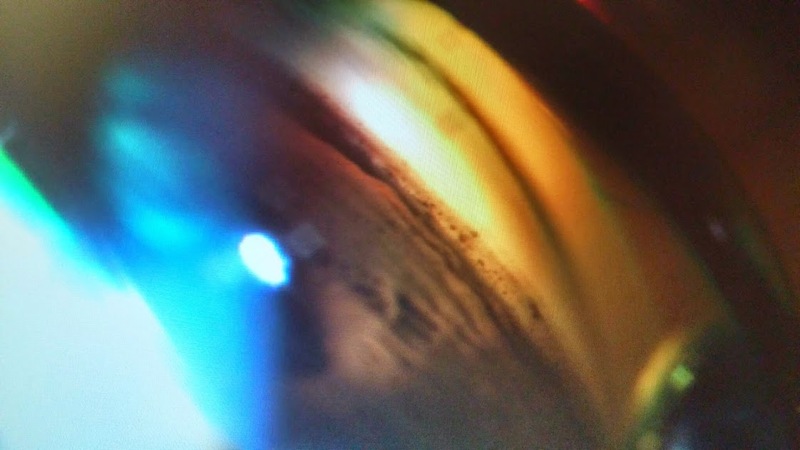 Gonioscopy picture of the right eye is attached. Based on this , the next step in the treatment of right eye is ALT vs SLT OR NEITHER? What IOP reduction would expect following ALT vs SLT ? If the IOP at presentation was 15 OU and the gonio exam in the right eye is as in the photo, what do you tell the patient? This is based on the gonio picture - note the torn iris processess, a whitened increasingly visible scleral spur and a localized depression in trabecular meshwork. Angle recession is associated with a split between the longitudinal and circular ciliary muscle fibers of the ciliary body. (Contrast this with Cyclodialysis cleft whcih is associated with disinsertion of the longitudinal muscle fibers from the scleral spur leading to increased uveoscleral pathway and hypotony). ALT/SLT has poor results in this situation and is a relative contraindication. If IOP is not controlled with medications, these may need surgical intervention such as trabeculectomy as the next step.